One of the most useful books I've ever read is "How To Buy Your New Car For a Rock-Bottom Price". It is full of so many negotiating gems and written in such an entertaining and useful style- I couldn't put it down. Consider the "Feel, Felt, Found" gambit to be used when the dealer tells you he can't go any lower on price. Here's how the book advises you counter such a tactic: "I know how you feel. My friends felt the same way when I told them I could get a car for below invoice. But after doing my research I've found that you can sell me a car for under invoice. And you will." It is truly a book I would recommend to anyone who is in the market for a new car. I've used techniques described in the book to successfully purchase several cars for just a few hundred dollars over invoice each. However, the book doesn't go too deep into specific techniques for getting the best prices on lease deals. I've always been intrigued by leases. Especially when I've just completed an expensive repair on an out-of-warranty car. I think to myself- that $1,600 I just spent on a brake job could have covered a lot of lease payments! Recently, we were in the market for a new car. I always keep an eye on models I'm interested in, and I like to stay flexible in terms of timing a new car purchase. The other day while we were at the Honda dealer to pick up some new wiper blades for our CR-V a kind salesperson asked me if he could help me. He showed me back to the parts counter and on the way we started talking about Pilots and Accords. We set an appointment to come back in to sit down and talk more, but after a few days we agreed to cancel the appointment because I wasn't sure whether we needed another car, whether we wanted to buy or lease and whether we wanted a Pilot or an Accord. But I asked him to drop me an E-mail if he ever had a smokin' deal on the cars I was interested in. A few weeks later I got an E-mail showing some phenomenal purchase deals. Pilots and Accords could both be had for a couple thousand dollars under invoice on in-stock inventory as part of an inventory reduction sale on 2010 models. We were shopping in March of 2010 so it didn't feel like we were buying last year's cars, and I've never heard of such good pricing on Hondas so I made an appointment to come in for a test drive. Although we loved the Pilot, when we ran the numbers it was just more money than we were willing to spend right now. I really wanted another set of wheels however so I started thinking about an Accord lease. Lease deals are interesting. You know when you hear an ad on the radio or see one in print and it has all kinds of fine print? It seems as if state consumer protection agencies demand car dealers disclose lots of information about lease deals but even when they do so, they don't do it consistently and they don't do it completely and understandably. This makes comparing lease deals difficult and it also make determining your initial and monthly payments complicated. Lease deals, especially those promoted by the manufacturer, are often unbelievably low. The trick often lies in hidden additional down payments- even in deals claiming to offer "no money down". Lease Example with $0 due at lease signing for $250 a month for 36 months. For well-qualified buyers." "Dealer contribution may vary and could affect actual lease payment. Taxes, license, title fees, options and insurance extra." Depending on how the dealer might toy around with their contribution, it's possible that this deal might not be attainable at your local dealer. Further, they might want to sell you goofy lease insurance that protects you against nicks, dings, and minor upholstery damage. In total it's not at all clear, even from reading through all the fine print, what the total cost of the lease deal will be. 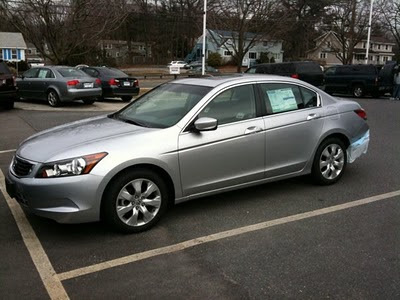 "2010 Accord LX Lease. $0 Down and $183/month." Fine Print: "Tax, Title, Reg, Customer Service Fee, Acquisition Fee, 1st mo payment Add'l"
Customer Service Fee? Acquisition Fee? How on earth would I know from looking at the ad what those charges are and more importantly whether those fees are reasonable or avoidable? For those reasons, I sought out a lease deal that was truly NO MONEY DOWN and included only 36 monthly payments. That's it. That's IT. One thing that frustrated me as I started looking around at lease deals is the way they all seemed to be for entry-level LX models. The LX model is fine and all, but if I wanted to step up just a little bit to an EX or EX-L I felt like the advertised lease deal was effectively out the window and the negotiation started from scratch. What I decided to do, and I think this worked well for me, was to make it clear I was ready to take advantage of the advertised lease deal to gain full clarity on any hidden costs. The offer I took advantage of said "$0 Due at lease signing/$225 a month/monthly fees exclude tax". I asked my salesperson to confirm there was no additional up-front costs due at lease signing. That he was certain there were no hidden fees (like an acquisition fee) and that things like tax, title, and registration was rolled into the lease payments. He confirmed this verbally, so I committed to lease the car over the phone and put $500 down on a credit card. I then asked my salesperson to E-mail me complete lease details so I'd be sure there was no misunderstanding when it came time to sign. "So long as we're at 36 payments of $239.07 with no additional costs we should be good to go Friday morning. it's truly the case that the $0 due at signing only applies to the LX then I'm fine with the LX. Friday morning to lease the LX at $225/month x 36 plus tax." He called me back with numbers on the EX and EX-L that aligned very closely with what I proposed. I was then free to choose from a reasonable menu of prices based on their color availability on the LX, EX, and EX-L. I chose an EX because it was only $20 more a month and added a lot of nice options. I thought this worked really well as compared to starting a negotiation from scratch on the EX because all of the terms were fixed and only the price varied. Of course, none of this will work if you're dealing with a shady car dealership. I leased the car from Bernardi Honda in Natick, MA and although I must have said to my salesperson a hundred times during the course of our transaction "no surprises now" I was pleasantly surprised that there were indeed no surprises or hidden expenses. I highly recommend the dealership especially our salesperson John Dwyer (no relation) and service advisor Bobby Gazza. Check out their latest deals HERE. I hope this is useful as you consider buying or leasing your next car. Question of the Day: What do you think of leasing? Smart money or sucker play?